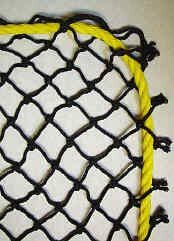 Web Devices provides installation of fall protection systems including personnel and debris nets. 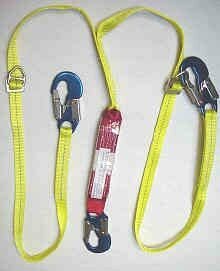 Other services include fall hazard risk analysis, system design, maintenance, inspection and certification, and a certified repair center for retractable lanyards. We also provide installation of pre-engineered horizontal lifeline systems, Web Devices installed a system on the Enron Field Roof in Houston which is now known as the Minute Maid Park. 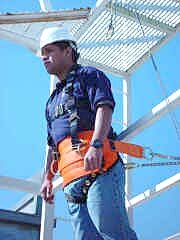 Full Body Harnesses; Shock-Sorb Lanyards; Cable Retractable Lanyards; Web Retractable Lanyards; Cable Ladders; Rope Ladders; Chain Ladders; Cable Grabs; Rope Grabs; Ladder Systems; Safety Hooks; Handy Hooks; Scaffold Hooks; Carabiners; Fall Protection Training; Single Lanyard; Wheel Nets; Personnel Nets; Debris Nets; Cargo Nets; Scaffold Davits; Roofer's Kit; Roof Anchors; Tool Spider; Anchor Pads; I-Beam Cross Over Straps; Beam Clamps; Rebar Chain Assemblies; Rescue Pole; Lifelines; Custom Made Products; Self Retracting Lifeline; Double Lanyard; Shock Absorbing Lanyards. The Web Devices Rescue Pole assembly is designed to aid in the rescue of an individual suspended in a full body harness. 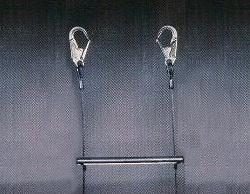 The rescue pole assembly permits a rescuer to reach the individual, connect to the harness and hoist.